The publication of the latest tick-tock story on the collapse of last summer’s Obama-Boehner budget talks has triggered a new round of dueling interpretations. Who really killed the grand bargain? Was it a speaker out of touch with his caucus, or a president who couldn’t make up his mind? There’s no doubt that both leaders have made mistakes, but all these breathless sagas suffer from the same flaw: They divert us from the structural facts that shape political outcomes. 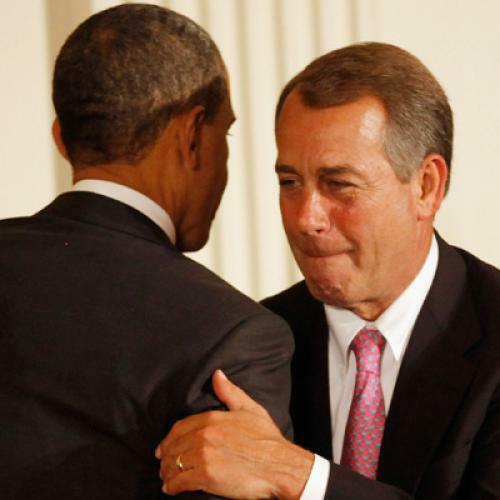 Barack Obama and John Boehner weren’t free agents; they were acting as representatives of their respective political parties, neither of which was prepared to do what it took to make a deal. The problem isn’t just political intransigence—it’s that neither political party has made an effort to convince the electorate of the need for change. Without that sort of public discussion, closed-door negotiations are bound to go nowhere. It’s customary at this point to cite the polarization between the parties, which has indeed grown significantly in recent decades. This phenomenon is more than a blood feud between rival gangs; the parties now espouse incompatible explanations for our long-term fiscal problems and propose incompatible remedies. For Republicans, it boils down to one thing—cutting spending. This premise inevitably leads to proposals like Paul Ryan’s latest budget, with huge cuts to Medicare and to safety net programs for the poor. In response, Democrats emphasize the need for increased revenue—after all, the aging population will increase federal spending as a share of GDP, and we’ll have to pay for it somehow. Of course, we could temper if not prevent this increase by shifting costs and risks to Medicare beneficiaries. But to do this, most Democrats insist, would be to trample on our promises, rip up the social contract, and end Medicare as we know it. But while party polarization plays a large part in legislative stalemates, the problem goes deeper. Neither political party has been willing to conduct a sustained conversation with the American people about the real choices we face over the next generation. If large political decisions are to be sustainable, they need to obtain the consent of the people—and it’s hard to see how the current discussion can generate that consent, or even contribute to public education. As Gerald Seib points out, the contenders for the Republican presidential nomination rarely utter the word “deficit” during debates and have failed to propose serious fiscal plans. To their credit, Ryan and Obama have both been clearer. But the public discussion of Ryan’s plan soft-pedals the extent of the changes it would impose on Medicare and Medicaid, while the president’s plan does little to address our longer-term structural challenges. Over the past few years, the argument that we needed to get the economy back on track before tackling fiscal issues has prevailed—rightly, in my view. But if we’ve finally reached the point at which the recovery is self-sustaining, it’s time to shift the focus of the discussion. A presidential campaign offers the best chance we’ll get to clarify the choices we face and to bring the people into the conversation. And if neither candidate wants to enter into that conversation, it’s the duty of the press to force the issue. At every juncture, Mitt Romney should be asked a simple question: Do you endorse the cuts in Medicare and Medicaid contained in the House Republicans’ budget? And if he spends the fall evading the question, he should be asked again, during the presidential debates, in full view of the American people. The stakes are high. We need to invest much more to rebuild the foundations of our economy, but right now we don’t have the fiscal flexibility to do so. What we manifestly lack, and desperately need, is a reformed tax code that promotes growth and eliminates special interest preferences. To set ourselves on a sustainable fiscal course, we need to reconcile the aversion to tax increases with the needs of an aging population—but we haven’t even begun that discussion. Great nations don’t remain great by avoiding their problems. Contrary to popular accounts, what we face today is not bad chemistry between leaders, or even the clash of political parties: It is a crisis of self-government. It will be a dereliction of duty if the presidential candidates don’t bring the American people into the conversation and level with them about the choices we face. Is it hopelessly naive to expect our leaders to do that?